Today we will continue our discussion of the Fukushima Nuclear Plant meltdown. The last post was a breakdown of initial events, explanation of radioactivity, and biological impacts. If you'd like more information and details than are posted today, I suggest you read the first Fukushima Post - Nuclear Impacts Part I. 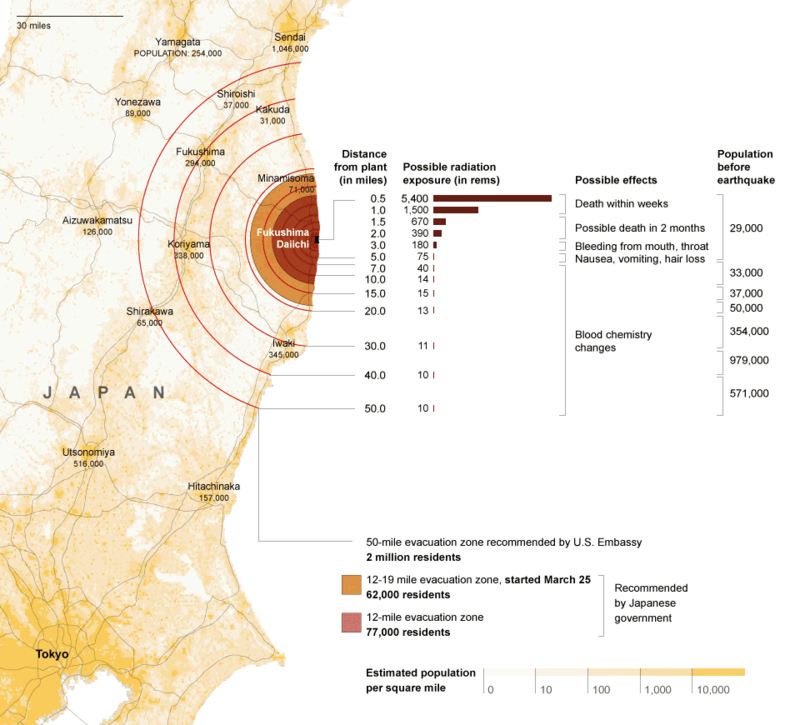 As a brief overview, shortly following the March 11 earthquake and tsunami, the Fukushima power plant in eastern Japan suffered massive meltdown of 3 of 6 of its reactors, as a result of flooding. The Japanese government hurriedly tried to fix the issue by using seawater to cool the rapidly-overheating reactors, which resulted in complete meltdown. As a result, 62,000 people in the surrounding area were evacuated. 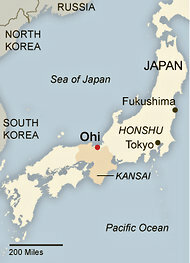 The Japanese government continues to try cleanup efforts to regain the area, which is thus far an unprecedented event. As of May 6, 2012, all 50 nuclear reactors in Japan were shut down for maintenance. 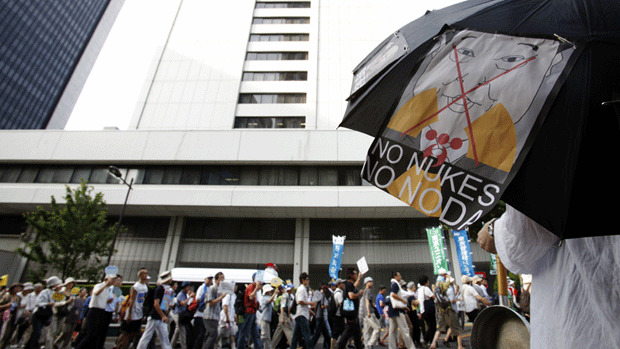 Because of the massive failure of Fukushima, the Japanese public's faith in nuclear power has been heavily shaken. What seemed like a point of pride and technology has incurred a sense of distrust for the general public. Especially bitter are those who lived and worked around Fukushima, and lost their homes and livelihoods as a result of the disaster. Concerned parties argue that because Japan is in the Pacific Ring of Fire, an area surrounding the Pacific Techtonic Plate found under the Pacific Ocean, that it is a poor location for such potentially vulnerable nuclear power plants. The Ring of Fire plays host to over 90% of the world's earthquakes, and 450 volcanoes. It also contains 75% of the world's active volcanoes. Before Fukushima, Japan relied on nuclear power for 30% of its energy. As a result of nuclear shutdowns, Japan has increasingly been importing fossil fuels as a source of energy. Japanese government officials - namely Japanese Prime Minister Yoshihiko Noda - have been pushing for putting nuclear reactors back online, arguing that the current state of affairs without adequate nuclear power cannot be maintained. The Japanese economy has also taken a hit, as rolling blackouts imposed to save power have resulted in reduced manufacturing and production in urban areas. Despite negative impacts, public distrust of nuclear power has sparked public protests against Japan's reliance on nuclear power. As of July 1st, the first nuclear reactor was put back online- Reactor #3 at the Ohi Nuclear Plant- under orders of Prime Minister Noda. The protests that ensued were very unusual (although peaceful) for the typically non-abrasive Japanese society. Ohi, Japan in the Kansai provence. The question arises whether or not Japan can sustain itself on imported fossil fuels, and whether this is really a better alternative to nuclear power. In addition to this, wind power has been touted as Japan's best alternative to nuclear power, but this would require massive construction of wind power mills. The question is whether Japan is willing to continue to give up their self-reliance as established by nuclear power, and continue to import fossil fuels. In addition, the question arises whether these fossil fuels are ample to support the industrial and technologically-powered society that embodies Japan's urban areas. Protests are sure to continue, and it will be weeks or months before a decision is reached.